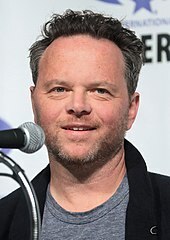 Noah Hawley (born c. 1967) is an American television writer and producer, screenwriter, and bestselling author, best known for creating and writing the FX television series Fargo (2014–present) and Legion (2017–present). Hawley earlier worked on the television series Bones (2005–2008), The Unusuals (2009), and My Generation (2010). Hawley was born and raised in New York City, New York. His mother, Louise Armstrong, was a non-fiction writer and activist, and his maternal grandmother was a playwright. His father, Tom Hawley, was a businessman. He has a twin brother, Alexi, who is a writer for the television show The Following and the creator of State of Affairs. Hawley graduated from Sarah Lawrence College with a degree in political science in 1989. He worked for the Legal Aid Society in New York City, dealing with cases involving child abuse and neglect. He later moved to San Francisco. He worked in computer programming at law firms and as a paralegal. He has published five novels: A Conspiracy of Tall Men (1998), Other People's Weddings (2004), The Punch (2008), The Good Father (2012), and Before the Fall (2016). Hawley was a writer and producer on the first three seasons of the television series Bones (2005–2008). He was also creator and executive producer of The Unusuals (2009) and My Generation (2010). Hawley is the creator, primary writer, and executive producer of the FX anthology television series Fargo (2014), based on the Coen brothers' 1996 film of the same name. On August 25, 2014, Fargo won the Primetime Emmy Award for Outstanding Miniseries, along with 17 additional nominations at the 66th Primetime Emmy Awards. In total, the series has been nominated for 113 awards since its premiere, winning 32 of them. Season 3 of Fargo premiered on April 19, 2017. In December 2015, Hawley extended his production deal with FX. He wrote and served as executive producer for Legion, an FX television series based on the Marvel comic book character. Hawley will also write and executive produce a limited series adaptation of Kurt Vonnegut's Cat's Cradle for FX. He will executive produce, but not write for, two additional adaptations for FX: Hellhound on His Trail, based on the book of the same name, and The Hot Rock, also based on a book. Hawley wrote the original screenplay for the film The Alibi (2006). In September 2014, it was announced that Hawley had signed a deal with Universal Pictures to script an untitled project for their upcoming Dark Universe. Sony Pictures has acquired the rights to Hawley's latest novel, Before the Fall, with him writing the screenplay. On July 20, 2017, Hawley announced at Comic Con that he is writing and directing a Doctor Doom movie with 20th Century Fox. He will make his feature film directorial debut with Lucy in the Sky, a drama film starring Natalie Portman as an astronaut, for Fox Searchlight. He has also been set to direct Man Alive, from a sci-fi spec script by first-time screenwriter Joe Greenberg. Hawley resides in Austin, Texas, and Los Angeles, California, with his wife, Kyle Hawley, and their two children. Hawley, Noah (1998). A Conspiracy of Tall Men. Harmony. ISBN 978-0609602805. Hawley, Noah (2004). Other People's Weddings. St. Martin's Press. ISBN 978-0312322731. Hawley, Noah (2008). The Punch: A Novel. Chronicle Books. ISBN 978-0811864299. Hawley, Noah (2012). The Good Father. Doubleday. ISBN 978-0385535533. Hawley, Noah (2016). Before the Fall. Grand Central. ISBN 978-1455561780. ^ a b Stanford, Peter (March 28, 2012). "Noah Hawley: 'It's the parents who create killers'". The Telegraph. Retrieved December 10, 2014. 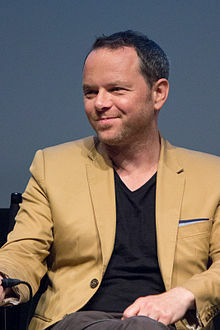 ^ a b c d "'Fargo' Creator Noah Hawley: How I Made It in Hollywood". The Hollywood Reporter. April 15, 2014. Retrieved December 10, 2014. ^ a b c "Louise Armstrong". The Guardian. Retrieved December 10, 2014. ^ "News and Announcements from Alums", Sarah Lawrence College website, accessed May 30, 2013. ^ a b c Ganahl, Jane (August 31, 1998). "Success stalks thriller writer". SFgate.com. Retrieved December 10, 2014. ^ "News and Announcements from Alums". Sarah Lawrence College. Retrieved December 10, 2014. ^ Elks, Jennifer , The Skinny, accessed June 21, 2011. ^ "Development Update:Wednesday, January 20", The Futon Critic, accessed June 21, 2011. ^ Holloway, Daniel. "'Fargo' Season 3 Premiere Date Set by FX". Variety. Retrieved 2017-03-11. ^ a b Wagmeister, Elizabeth. "FX Inks New Deal with 'Fargo' Creator Noah Hawley, Sets New Development Projects". Variety. Retrieved 2016-04-20. ^ "'Fargo' creator developing 'Legion' series with Marvel and FX". Entertainment Weekly's EW.com. Retrieved 2016-04-20. ^ Andreeva, Nellie. "'Cat's Cradle' Limited Series Adaptation In Works At FX With Noah Hawley & IM Global". Deadline. Retrieved 2016-04-20. ^ Elks, Jennifer "Lies and Alibis", Coming Soon, accessed June 21, 2011. ^ a b Jr, Mike Fleming. "'Fargo's Noah Hawley To Adapt His Novel 'Before The Fall' In Sony Pic Deal". Deadline. Retrieved 2016-04-20. ^ Kroll, Justin (11 January 2018). "Natalie Portman in Talks to Replace Reese Witherspoon in 'Pale Blue Dot' (EXCLUSIVE)". Variety. Retrieved 24 January 2018. ^ Hipes, Patrick. "Fox Acquires Newbie's Sci-Fi Spec 'Man Alive' For 'Fargo's Noah Hawley To Direct". Deadline. Retrieved 2016-04-22.